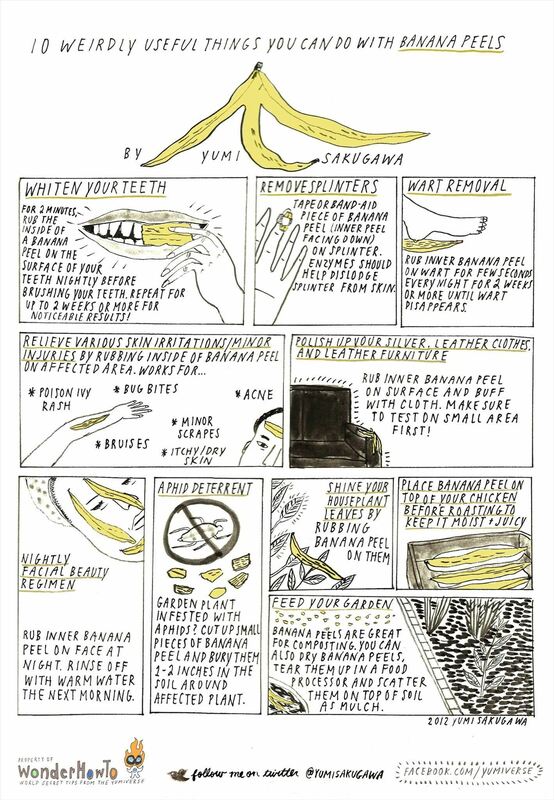 Other than something you can place on the floor as an ironic reference to a bygone era when a banana peel fall was considered to be the height of comedic gold, banana peels have many weirdly useful applications for your beauty regimen, the maintenance of your leather couch, the health of your backyard garden, and more. Banana peels are loaded with potassium, the antioxidant lutein, and loads of other powerful enzymes and nutrients that make them ideal for giving your skin some youthful beauty glow, removing your splinters and warts, and alleviating your bug bites. And if you are ever roasting chicken at home, place a banana peel on top of your chicken breasts before cooking to keep them juicy and moist before you eat them. Got your own experiences with using banana peels? Share with us by commenting below!